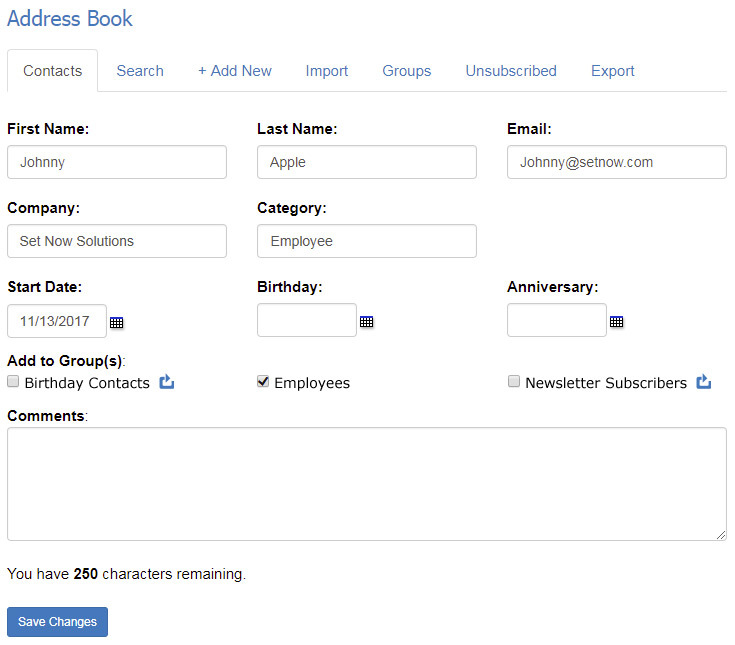 By using CorpNote's address book, you can more easily address eCards and invitations, auto-fill the greeting line, track pickup and set recurring eCards. You also have the ability to see the complete history for a contact including the groups you have assigned them to, whether they viewed your eCards and whether they responded to your invitations and surveys. This tutorial covers searching for contacts, viewing a contact's history and editing a contact's information. Go to My Account > Address Book to quickly search for a contact by name or email. 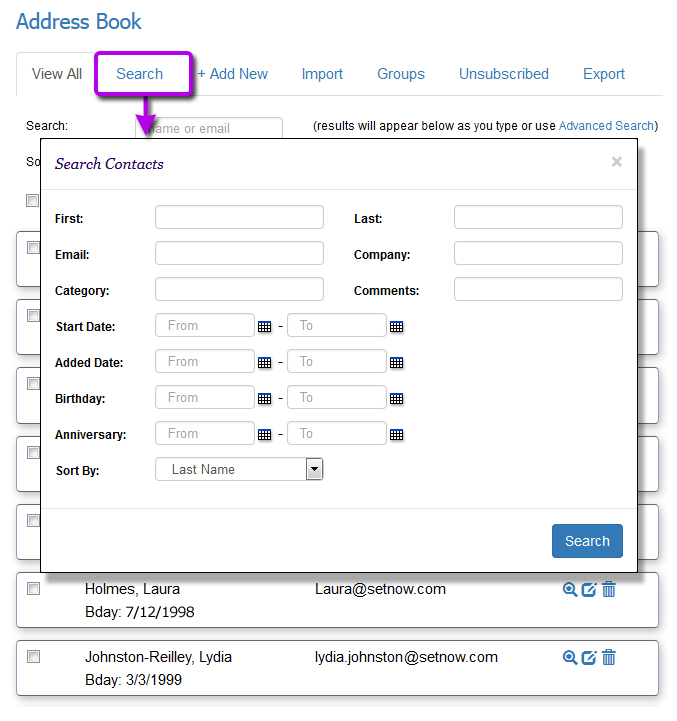 Click the 'Search' tab to perform a more advanced search such as company, birthday or comments. Once you find the contact, click the desired icon to view, edit or delete a contact (see example). Click the view icon to see details for a specific contact. 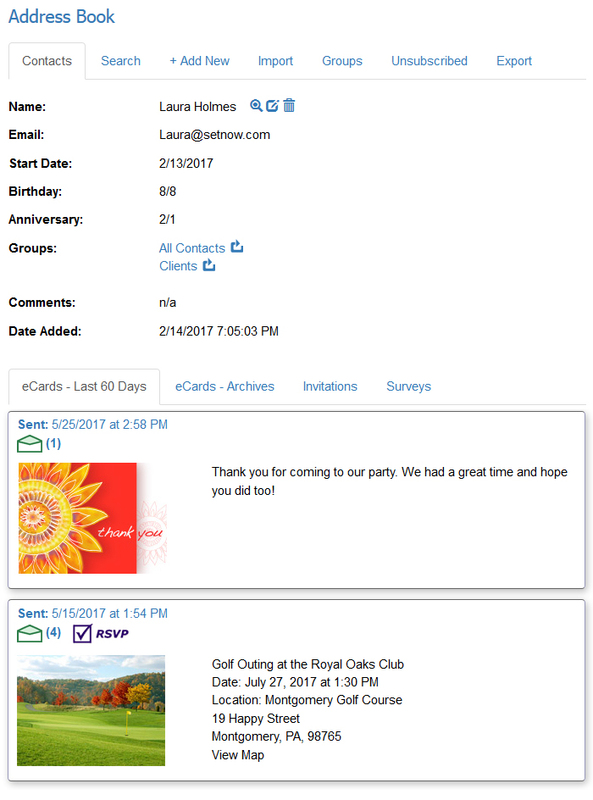 This includes the groups you have assigned them to as well as eCards, invitations and surveys for which you have included that contact (see example). 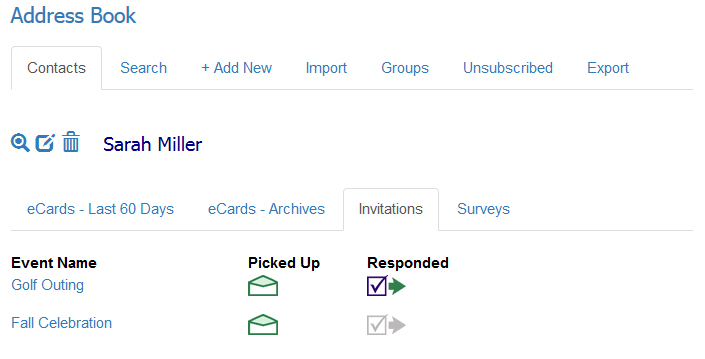 Click the Invitations tab to see events you invited the contact to and whether they responded (see example). Click on the event name to see all responses for that event. 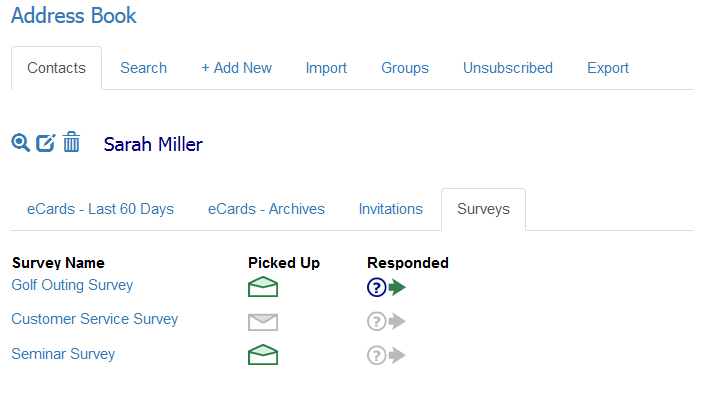 Click the Surveys tab to see the surveys you asked the contact to complete and whether they responded (see example). Click the edit icon next to a contact. If you edit a contact that you have assigned to groups that have recurring eCards with a send date of today, you will be asked if you want to send the eCards today. If you choose not to send the eCards, they will not be sent but the recipient will be included the next time recurring eCards are scheduled to be sent for the groups to which they are assigned. If you click the delete icon, you will see a confirm delete screen that enables you to delete that specific contact. You can also delete several contacts at one time from the search results screen. Check the box next to each person's name and then click the 'Delete Checked' button. Important: You will NOT receive a confirmation for the multi select delete. The contacts selected will be deleted immediately. Deleted contacts cannot be restored.